This enchanting villa on Victoria Park waterfront offers four bedrooms (king size beds) and bathrooms, a huge living room; separate dining, lounging area and a desk. Spacious master suite with sitting area, whirlpool tub and a separate shower. A guest suite with a private bath on the second floor. Relax away the day's worries and enjoy crystal pool, water view and passing boats. Keywords: Probably the most beautiful street in Victoria Park. Villa with waterfront, dock and heated pool. Private garden, screened patio with BBQ-kitchen. Large entertainment area. King-size beds and guest suite. Flat screen TV's, high speed wi-fi Internet, child friendly and fully fenced. Ahldin Villas Fort Lauderdale offer properties in prime location. We provide contemporary hotel standard and accept all major credit cards. 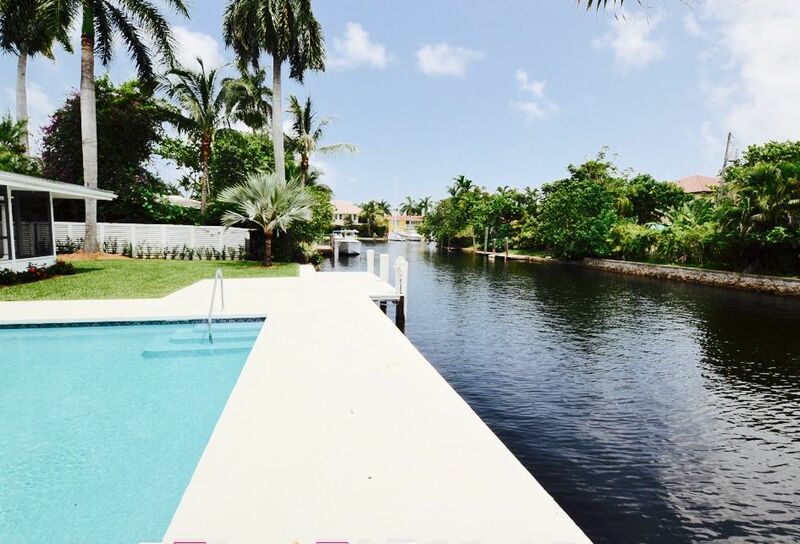 This property is part of Ahldin Villas, a private owned company that rents quality villas with the best location in Fort Lauderdale: All are houses are located on the water with dock in quiet and residential neighborhoods, close to the beaches, the Intracoastal Waterway and Las Olas blvd with shopping and restaurants. Every home is furnished in a European fresh style with a fully equipped modern kitchen, heated swimming pool, BBQ grill, satin linens and towels from Ralph Lauren and WIFI Internet access. With a private well-maintained garden you can relax, far away from crowds and other guests. Furnished in a European fresh style with a fully equipped modern kitchen, heated swimming pool, gas grill, satin linens and towels and free Internet access. Overall the house was good. There are a few things that need addressing and I let the owner know. Hopefully they will be addressed. The location is great. The pool and patio area are very nice. The furniture in the living room was uncomfortable and dirty but we didn't spend a lot of time there. The kitchen is well equipped but the induction stove top was not working properly. We found several dead roaches in the house but that is an issue in many houses in Florida. The beds are comfortable. The bathrooms are nice. The pool cottage is a nice additional space. I would stay there again. Thank you for staying with us and for your feedback. Happy that you liked the villa and the area. We have steam cleaned the furniture. Please make sure not to have windows and doors open. Bugs can then enter villa. We treat all our villas on regular basis. Regarding the cook top we have added a frame next to the countertop with instructions on how to use the induction cook top that is now working fine. Happy too that you loved the pool and patio. It was a pleasure hosting you and your group. Warmly welcome back and hope to see you soon in Fort Lauderdale. The property on Riviera Isle Drive was wonderful. It was roomy and spacious. All the bedrooms had comfortable mattresses and pillows. The pool was large and we enjoyed many moments in the pool. The staff was attentive to our needs. We will definitely rent from Ahldin Property Mananagement again. This house was perfect for our recent stay in Fort Lauderdale. The layout of the home is perfect for a group traveling together, with en suite bathrooms for each bedroom and a separation of spaces that gives everyone a bit of privacy if and when needed. Loved the indoor/outdoor living situation and the beautiful canal, which was filled with wildlife. Thank you for staying with us! It was such a pleasure hosting you. We are happy you enjoyed being on the water and the perfect location for fishing. We sometimes see manatees too. Welcome back! Deilig stort hus, ideelt for 8-10 personer. Nydelige solnedganger. Fint uteområde, ypperlige omgivelser. Hus og basseng noe nedslitt, men fungerer helt Ok.
Well starting off the house for us was perfect in size, layout and location. Plenty of room for all the people we had together and the covered area outside was great with plenty of places to sit and relax. Having the pool was perfect , especially when my 3 grandsons showed up after a 4 hour drive ! Our rooms were nicely laid out and beds were all very comfortable, and having the washer/dryer was ideal. Of course with the positives there is usually some negative. I like to give constructive rather than just complain which doesn't help any. The biggest problem we had was not having anyone meet us that Friday afternoon. Because when we got there we realized there wasn't enough sheets and towels for my daughter and her family upstairs, and they were supposed to bring a regular size coffee pot as well. Along with that we had electrical issues. My daughter was using a hair dryer upstairs , which caused her bathroom light to go out and unfortunately the router as well which was up there so we had no WiFi either. I was certain we could take care of all this IF WE COULD JUST GET SOMEONE TO FIRST RESPOND AND THEN COME OUT!! After dinner out we all came back that first night and , after trying to reach our contact person unsuccessfully several times, let it go until the morning, but not until an email was sent to the owner. The following day we received an apologetic response from her and we also received an actual contact person at our door with all the items we lacked, minus the electrical issues, which never got resolved. So overall our stay went well, the house, which had some little issues with upkeep, was functionally perfect and we had a great time. But .... i would hope that if there is a next time that they would make sure contact person is visible, and more importantly, that any electrical issues are taken care of BEFORE guests arrive!! They were unable to contact electrician until the day we were leaving, which is really unacceptable. So having the staff they need to properly run this place is a priority, for walk through, to answer any questions, and to have basic linens available. And a reliable electrician or maintenance person should ALWAYS be ready. Having said all this we really did enjoy what the house provided in location and space, even the table and chairs outside by the inter coastal was awesome. Contact person was very sweet but i only wished she had responded sooner than she did, especially when problem arose that first night. Rates are subject to change until reservation is confirmed. Note that we have a minimum stay of 4 weeks during Christmas season and only make exceptions on last minute dates. Special price during Holidays, Fort Lauderdale Boat Show and for long term rental. Please contact us for price and details. In order to prevent spam/scam type emails, all inquiries will be answered from guests@ahldinvillas.